In addition to the phone models in the above table, you can configure just about any SIP compatible device as a Generic-SIP extension. 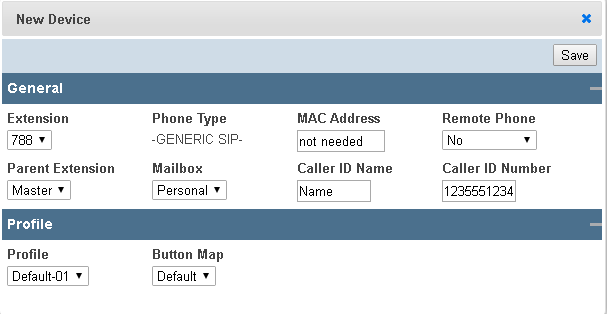 If your phone supports SIP and is not listed in the table above, you can configure it as a Generic-SIP device. Softphones are configured as Generic-SIP devices. You may also configure the system to add your Cell phone as an extension. Cell phones extensions support call acknowledgement, where you can force the user to acknowledge the call before it is delivered, eliminating calls from landing in the cell phone voicemail. Phone Number The cell phone or remote PSTN number you would like this extensions to dial. Be sure it is input similar to how you would dial the number from a local phone. Analog phones can be connected to the PBX directly via an analog FXS phone line module, or more commonly through a analog ATA adapter or SIP gateway. 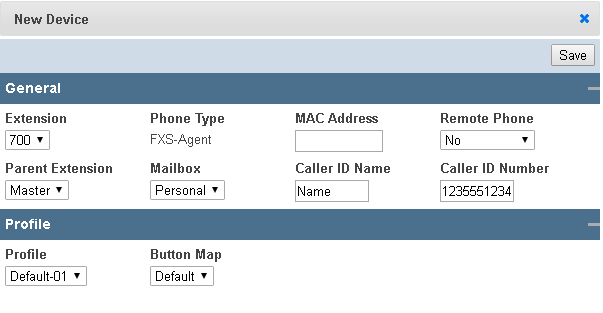 If you are connecting an analog phone directly to the PBX, you will need to add the phone extension as an "Analog-FXS-Agent." However, if you are connecting an analog phone into an ATA adapter or SIP gateway that connects to your network, you will add the phone extension as a "Generic-SIP" device. Cell Phone: this type of virtual extension allows you to use a cell phone as a type of extension. 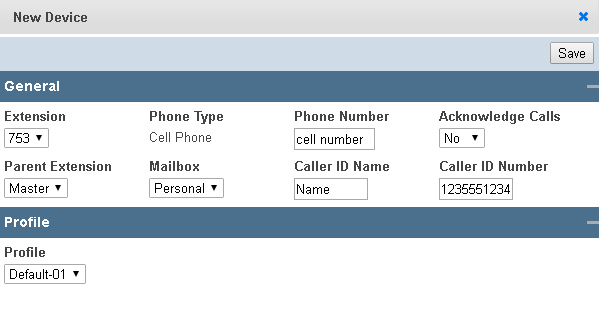 When you dial this extension, rather than ringing a device, the PBX will call the specified cell phone number. This allows you to more easily integrate cell phone users into the PBX without having to give them a desk phone or softphone. Fax: the basic function of the extension is to serve as fax-to-email. Faxes sent to this extension will be emailed to the specified email address. Hotdesk-Agent: if you have agents or users that are not assigned a physical desk phone, use this extension type to assign the agent/user an extension number and password that he or she can use to log into any phone in the office. When logging in/out, the agent's extension number is added/removed to/from any queue he or she is a member of. The default dial code to login/out an agent is *30.